You could use any kind of clay that you put in a kiln (oven for cooking clay) or a self hardening clay. 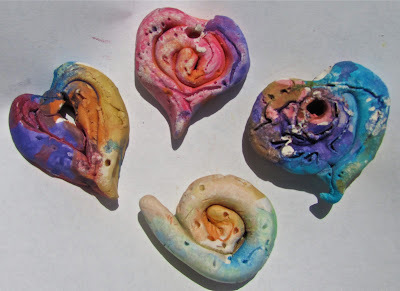 Since I already had some Crayola Air Dry Clay that is what we used and it claims to dry in two days! 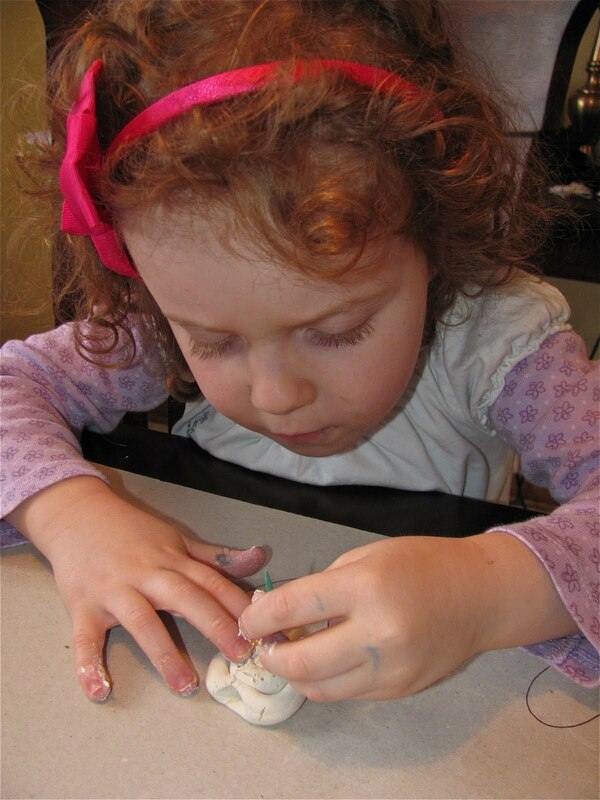 You could also use Sculpey (a polymer clay) which you have to bake in your oven or even a Homemade recipe using flour, water, and salt. The homemade self hardening clay recipe (click on the link) dries in about two days with this small size of a project. FYI: This homemade clay has taken longer than two days! The first step is to roll out a ball of clay smaller than a golf ball. Then after we rolled out a ball, you need to make a snake and Cassie is a pro at that! Next, using our Snail making skills from my Play Dough Snails Post, we made a spiral! After the spiral, you need to shape it into a heart by pushing an indention for the top of the heart anywhere on the spiral and then pinching the area below to create the bottom point. This was a little tricky, but after practice Cassie could do it! On the heart we used a toothpick to carve some simple designs and I used a straw to create the hole for the string. Here is some serious concentration from Cassie! After this step, we had to wait a couple days for the clay to dry to paint the pendants. We used watercolors to paint the hearts. Cassie really enjoyed this part and painted both sides! Watercolor dries very quickly because it soaks right in! No need to really wait for them to dry! Here are Cassie's finished hearts---along with a snail too! 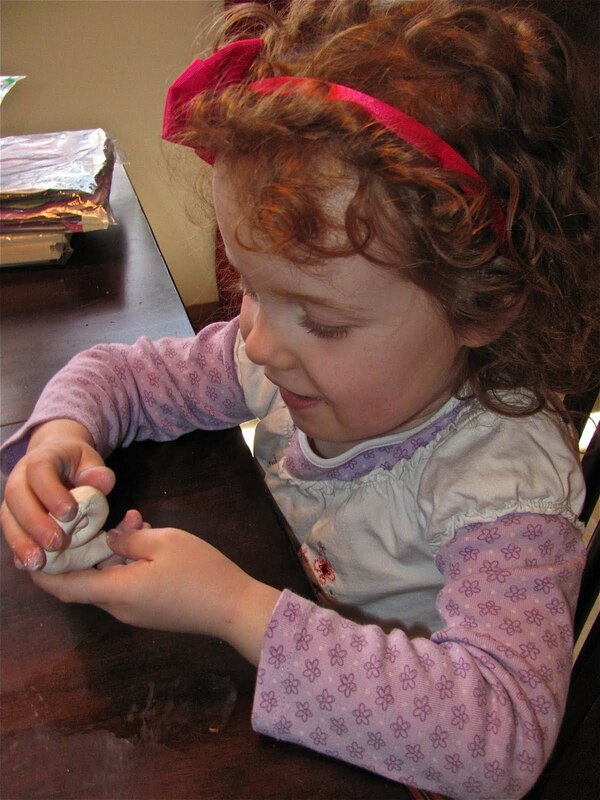 She wanted to create just a snail because of our recent fun with making play dough snails! You could add Modge Podge over the painted pendants to give them more of a glossy look! If you were using the homemade recipe, Modge Podge would help protect it from getting wet and deteriorating! After the hearts were dry, we used a small piece of pipe cleaner for the loop on the heart and a piece of yarn for the necklace part. You could add beads, colored pasta, or clay beads to the yarn too. Once again here our wonderful Spiral Heart Pendants. I think they could make a great gift for Mother's Day, Valentine's Day, or even a Birthday gift! I think they are wonderful! Be sure to check out Art Matters to take a look at their pendants too. If you are a Mother, would you like to receive this as a gift? What has been your favorite homemade gift from a child? I would love to receive this! Will Cassie be mailing me one? :) And they could actually be pretty classy if you added a large silver jump ring and chain. Mother's Day -- must get on this!! this is sooo cute! such a precious gift! handmade is my favorite! i love the effect that the watercolors have on them! have you tried liquid watercolors before too? Oooh these are LOVELY! They turned out so well. Pretty colours too! These are so lovely, definitely any mother would be thrilled to receive this! One of my most favourite homemade gifts from my son was a lovely tissue flower he made in grade school. It looked like he'd taken time and effort to create, and of course I just loved anything he created with his own hands. This so nice, Melissa. My Mother's Day project (painted clay pots, and a marigold seed) is behind, so I might borrow this idea from you for a quick project, so we have something to give by Sunday. I love these and I would absolutely love to get one for mother's day. Anything the kiddos make are always something special. Hi Melissa! these are so gorgeous, and there I was wondering what to make out of the air drying clay I bought! I think I just found my answer! PS - thanks for dropping by and leaving a comment on my blog! This is so super pretty! I think despite my prior statements about not making my own Mother's Day gifts I might make some with Anna for her teacher appreciation days. Such a cute idea!! I didnt know they made air drying clay. I will have to remember that! nice content.it's really simple and cute Heart Pendants necklaces.